In 2015, there were 21,945 active enterprises in Somerset. 6,475 were located in South Somerset District (29.5%). West Somerset was the only district in Somerset who had a fall in the number of active enterprises between 2014 and 2015. In 2015, there were 1,815 business ‘deaths’ in Somerset; 8.3% of the total active enterprises in the County. This is a slightly lower rate than the UK (9.4%) and Heart of the SW LEP area (8.7%). Business death rates peaked in 2009 after the financial crisis. 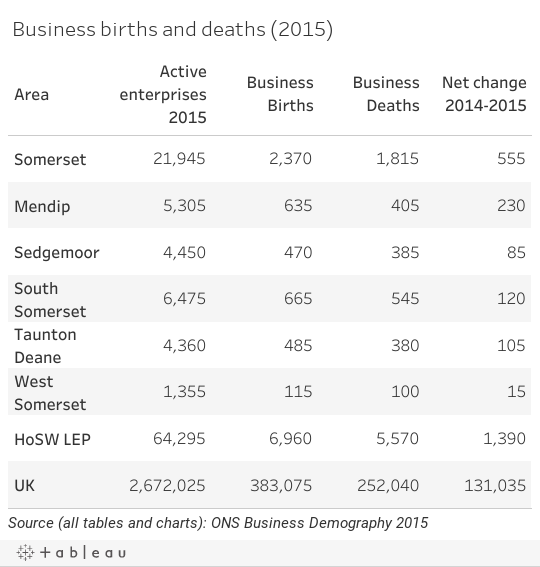 In 2015, there were 2,370 business births in Somerset, a rate of 10.8%. This is lower than the birth rate of 14.3% for the UK area. The number of start-ups in the County has fallen since 2013. The number of active enterprises in Somerset peaked this year with 21,945. 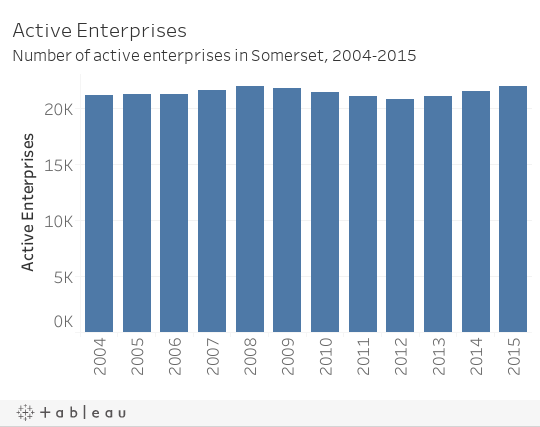 The number of active enterprises in Somerset rose by 445 between 2014 and 2015. This is a rise of 2.1% which is slower than the national rise of 4.7%. The number of active enterprises in the County has returned to pre-recession levels. 43.7% of Somerset businesses started in 2010 were still trading 5 years later, compared to 43.3% across the LEP and 41.4% for the UK. 2010 was the worst year in recent times to start a business. Only 88.7% of Somerset businesses started in 2010, were still trading in 2011. It was a similar picture for the LEP and UK areas. The highest 1 year business survival rates for births in 2014 in Somerset were West Somerset (95.5%) and Taunton Deane (94.7%) respectively.